When they hit the House floor for a vote this month, it appears doubtful that budget bills for the departments of Community Health and Transportation will contain new funding for expanding Medicaid or highway construction. Gov. Rick Snyder asked for both in his proposed 2014 budget, but the relevant legislative subcommittees replied in the negative. Also shelved before the Legislature’s Easter break was Snyder's request to spend federal money on a state-federal health insurance exchange per the Affordable Care Act. To top it off, the House subcommittee on higher education docked the University of Michigan, Snyder’s alma mater, $41 million. So much for relentless positive action. As Snyder signs almost all of the bills that Republican majorities in the House and Senate place on his desk -- including those he knew would damage him politically -- he might want to start wondering why, given all it's gotten him. If the governor is operating under the understanding that the GOP is one unified team committed to a common agenda, majorities in the House and Senate sure aren't. Going into a presumed 2014 campaign for a second term, Snyder is confident that an assembled package of tax changes and public investment -- assuming the monthly payroll employment number cooperates -- will be seen by voters as a credible response to a decade of economic decline. His fellow Republicans in the House and Senate? Not so much. February's unemployment rate was still a stubbornly high 8.8 percent and lawmakers are running for the hills back to a political base that wants less government and even fewer taxes. This applies with particular force to those taxes raised two years ago. Angry retirees are writing out checks to the state of Michigan this tax filing season, instead of getting them back. Normally, Snyder would have most of the year to get something done before the gravitational pull of the 2014 elections -- primary and general -- began testing the intestinal fortitude of legislators. Also, the 2014 election will be the ninth for state office since term limits kicked in. Lawmakers should realize by now that you can’t make a career in the Legislature anymore, so you might as well take some risks. Still, $82,485 in salary and expenses, full family health coverage, mileage reimbursement and the perks of being lobbied -- even for six years -- is not something to sniff at. At least self-preservation is rational. Expanding Medicaid allows a GOP primary opponent to call it an embrace of Obamacare. And increasing the gas tax might be no more popular in the general. More troublesome is the reflexive opposition to any departure from core ideology that Republicans nationally are becoming known -- and hammered in the polls -- for. And that it doesn't matter if the governor is a Republican or a Democrat. It’s a stance that plants both feet in obstruction to Snyder's view that $2.5 billion spent to cover road construction and the uncompensated medical costs now being shifted to employer-provided plans has economic benefit, even though government is doing the spending. Lawmakers must not believe, or care, that the state is taking in the same amount of transportation funding that it did a dozen years ago. Or that uninsured adults who would qualify for Medicaid under the expansion are constituents, even if they don't vote GOP. Apparently, under the guise of taxpayer protection, more pressing budget work requires punishing the constituents of school districts, municipalities and universities that legally reached new bargaining agreements before last year’s cherished Right to Work bill took effect. It’s still early in the budget process and legislative bullying can be stripped out of final versions, if a governor's signature requires it. But it’s a lot harder to add money in -- particularly on the scale of increased spending that Snyder has proposed. What these opponents haven’t done is explain why Snyder’s budget would be bad for Michigan’s economy. And that’s because they can’t. Yet they also can’t bring themselves to concede the opposite -- that it would be helpful -- because that runs counter to today’s increasingly conservative orthodoxy. So the most important question this spring for a Republican Party that controls state government is whether Snyder’s brand of business-friendly economic activism will, when the final budget bills hit his desk, prevail? Or will it be scrapped by legislators aiming to please Republican voters in their gerrymandered districts who want a low-cost, low-service, partisan platform that a rejection of Snyder’s budget would help cement in place? This is why redistricting reform is vital for the future of our state...and our nation. An impartial redistricting plan would reduce the influence of the far right -- and the far left, although that's not at issue right now -- forcing decisions that are supported by the vast majority of people in the nation and the state. Snyder has made his bed, and hopefully will be very uncomfortable trying to get re-elected on it. I supported him in the primaries, and attended the election victory party - mostly for business reasons. When I was there I was horrified, and really kind of sickened by the hate filled, triumphalist speechifying that went on by major republicans in this state (Weiser for example) about how they were going to grind democrats, liberals, labor, etc. into the dust with their majorities. Guess what? They have done exactly what he and others there that night said they would. One well meaning nerd probably cannot bleed the poison out of that party. Too bad Snyder won't have the guts to switch parties and run as a Dem. He could probably get elected, and might actually be able to execute on his agenda if he did. If it is all about the Governor's re-electability then shouldn't there be some consideration made to who is the electorate (why did they vote for him last time), who will be running against him (who knows, will there be someone), the polotocal mood at the time. Mr. Luke seems to put a lot of wishful thinking into his article that is at best a guess about what will influence the next election. It would seem to be more education if Mr. Luke had researched the reasons for the divergence he sees and shared that with readers so they could could become better informed. Ah, but that would have been about trusting to readers and not all in the media seem to be able to do that. 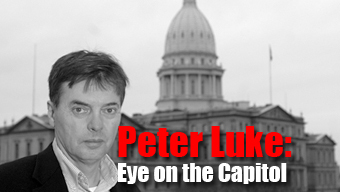 Mr. Luke says, "More troublesome is the reflexive opposition to any departure from core ideology that Republicans nationally are becoming known — and hammered in the polls — for." Isn't it odd that Republican policies intended to promote the long term general welfare are "ideology", whereas Democratic policies of something for everybody are wise public policy. And, "It’s a stance that plants both feet in obstruction to Snyder’s view that $2.5 billion spent to cover road construction and the uncompensated medical costs now being shifted to employer-provided plans has economic benefit, even though government is doing the spending." Just how is shifting "uncompensated medical costs" from employer provided plans to government an economic benefit? Individuals wind up paying for them in both cases. I can't tell if the last question is a question or rhetorical. As long as Michigan elects Republican legislators in both houses, we will get "low cost, low service" government. If that is what the people want, so be it. It doesn't help that the democrats are disorganized and impotent.